The formula used for calculating the available capacity of the sewing line is discussed here. The available capacity of a line is presented in minutes or hours. The capacity of a line depends on the average efficiency% of the line and operator absenteeism%. First line wise capacity is calculated and then added all line's capacity to calculate the available capacity of the floor. A factory floor has 5 lines. Factory works for 8 hours day. No of total operators, line efficiency, and absenteeism percentage are as given in the following table. Capacity can be also represented in pieces. To get it divide total capacity (in minutes) by SAM of the garment to be made on the floor. Suppose a factory produces basic full sleeve shirt of SAM 20. Shirt production capacity of the floor will be 1463 pieces per day (29268/20). 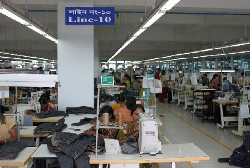 Also read: How to calculate production capacity of garment factory? Sewing floor capacity calculation method, and formula with examples.